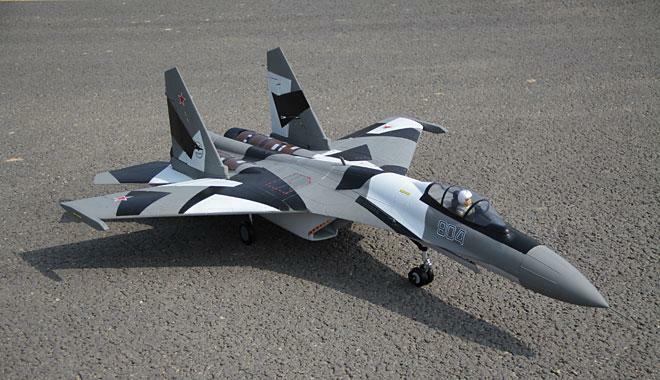 Freewing is Back with another almighty edition to their world wide renowned range of EDF jets, the SU-35 Twin 70mm EDF T/V Jet. Built on the success of our current Freewing/Xtreme Hobby F/A-18 and the recently released Seb-Art Freewing SU-27, the SU-35 breaks all boundaries in the fight for sky superiority in the EDF market. Featuring 2 available colour schemes (Snow Camo and Desert Camo), a brilliant Twin 70mm EDF Fan system pumping out over 3000g of Thrust, a detailed sequenced retract and gear door system, detailed pilot, scale finish and the thrill of the 360 degree Dual Thrust Vector Nozzle System, you will never want to fly another jet again after pushing forward on the throttle stick of this amazing machine. The build is easy, taking no more than 1 hour to complete from start to finish. In fact this is the first Freewing Jet to require no gluing in order to join the Main Wings, Vertical Tail and Elevators to the Fuselage. Using a unique Spar and Tab System (see photos below), Each Surface is screwed into place creating the perfect bond for maximum strength during High G Stress Manoeuvres. The kit includes a detailed manual with picture diagrams leading you step by step through the build process and the indicated C.G. is SPOT ON, our test model featured in the video below required only 2 clicks of up trim and we were flying straight and level. In fact the maiden flight for this plane was featured at E-Jets 2012 in Brisbane on the 19th of Feb. In front of 200+ people we performed this test flight as an indicator of the strength and trust that is supported within a Freewing model of this calibre. Nothing to add other than your Receiver and 6S 4000-5000mAh LiPo Battery pack (estimated 5-7min Flight Times). As an alternative 2 x 3S battery packs can be used. All servos, retracts, thrust vector nozzles, ESC's, Fan units and Motors are pre-installed at the factory. Take your Jet collection to the next level with Freewings SU35, available now from Xtreme Hobby. 6ch Radio System (Minimum) Required. To make full use of all functions of this jet a 7ch System is required. Just supply your own Radio System and LiPo Battery + Charger and you're ready to fly!